Photograph of an ancient Hindu wood carving from Kashmir Smas in Peshawar District taken by an unknown photographer in the 1880s. Peshawar is located in northern Pakistan. 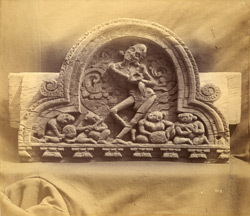 This plaque was found close to another plaque and together they constitute the only carved wooden pieces that had been found in the Kashmir Smas when this photograph was taken. They were discovered by Major H.A. Deane in a guano filled cave which would have provided preservative conditions. They appear to be quite ancient and are carved in a Buddhist style although they clearly depict Brahmanical themes. This plaque is supposed to represent the deity Natesha and both pieces can now be found in the British museum.